There are more than 6000 statues of the leader in Russia, to go along with monuments to Lenin in the CIS and the Eastern bloc, Cuba, the US and Antarctica. RIR picks five of the most unique ones. 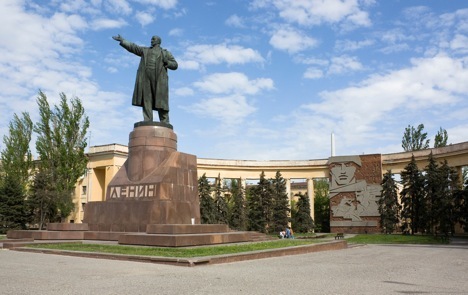 The leader’s bust was first made on February 19, 1919 by a sculptor called Georgi Alekseyev (it was later erected in Petrograd).Officially, however, the first monument to Lenin is considered the sculpture erected in Noginsk (since it was a full-height monument). It was opened on the next day after the death of Ilyich, on January 22, 1924. Is visible from space. Forty years ago, between the Trud and Znanie settlements, on the border of Siberia and Kazakhstan, Alexander Kanschikov, the chief forester of the Zverinogolovskoye forestry planted trees forming huge letters saying "Lenin – 100 years", which required one million seedlings. The letters’ height was one hundred meters, their width was fifty meters. The letters were discovered relatively recently, using Google Earth.